Australian designer Cristina Nitopi will return to Couture Fashion Week to present her latest luxury menswear collection. 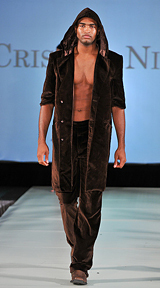 The fashion show will be held on Sunday 15 February 2009 at 8:30 p.m. at the world-famous Waldorf-Astoria Hotel in New York City. Ms. Nitopi realized a childhood dream of having a fashion show in New York with her first appearance at Couture Fashion Week 2007 to positive reviews. Her latest fashion show in New York in September 2008 included both men's and women's designs, and her upcoming fashion show in February 2009 will feature menswear exclusively. With her latest collection, Ms. Nitopi is tackling a new challenge outside the "comfort zone" of designing womenswear and seeks to introduce a modern innovative edge to menswear through the use of very soft fabrics and unexpected textures. As she continues to take on new challenges, Cristina Nitopi recently announced the upcoming opening of her first boutique in March 2009 in the Sydney suburb of Leichardt, at The Italian Forum.